Where the water and rocks meet, you will feel the rush as the river flows over the escarpments edge. So appealing that they merit their own tour, these special places are often just a short drive or hike from busy roads. 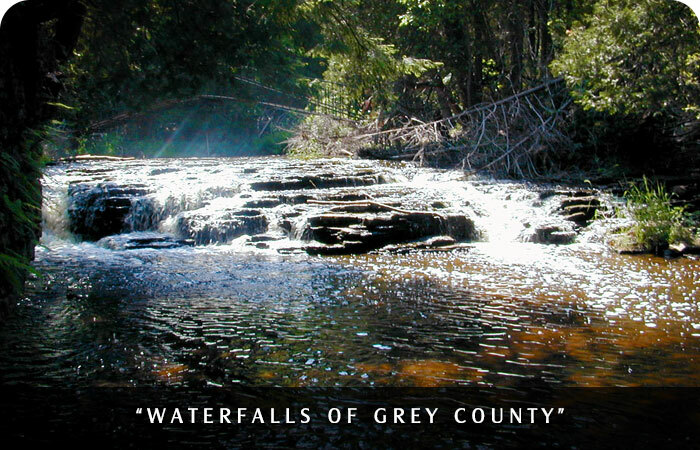 Host Tom O’Boyle will visit all 7 of Grey County’s waterfalls on the 115 mile self-guiding driving tour. We have collected information and web links related to the area and combined them here with photos we took and video clips from the show in what we hope will be a helpful guide as you plan your trip. Feel free to select only one or two activities per day according to your family’s interests. For assistance or for more information, call Grey County Tourism - 877-SEE-GREY Have fun! Directions: You can find us off of Hwy #6 west of Rockford, south of Owen Sound, at Inglis Falls Road. 112 km (70 miles) west of Barrie; 202 km (126 miles) north of Toronto. Our co-ordinates are +44.52215 latitude and -80.94113 longitude; CR-18, Georgian Bluffs. Grey Roots Museum & Archives attractions preserve and promote the cultural and heritage traditions of Grey County. Interpretive programs and demonstrations, rotating exhibits, a heritage village, and archival resources create an exciting and educational visitor experience. The building also houses Grey County Tourism where you’ll find maps, brochures, and other travel information with plenty of knowledgeable friendly people to help point you in the right direction. Its also home to Grey County’s only indoor waterfall. Just a short drive from Grey Roots is Harrison Park, Owen Sounds premier Family Park. Situated on the picturesque Sydenham River, Harrison Park is an assortment of lush green space, hiking trails, walking paths and hundred year old trees. A campground, tennis courts, paddling options and a liscensed restaurant are just some of the many amenities located in the park. 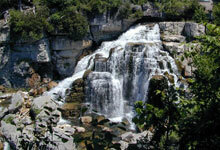 Hidden in the abundant woods of Harrison Park is Grey County’s newest addition to its water fall tour, Weavers Falls. Hidden behind the parks swimming pool is a trailhead that leads down a narrow picturesque path that meanders along Weavers Creek to the base of the falls. This beautiful pathway has benches along the way for relaxing in this peaceful setting. Directions: From Springmount, follow County Road 18 south, continue on County Road 18 east, past Grey Roots. From Grey Road 18 turn left onto Inglis Falls Road, signage will direct you to the entrance of the Inglis Falls Conservation Area. Inglis Falls forms where the Sydenham River cascades over the limestone shelves of the Niagara Escarpment. This 18-metre cliff viewed from any angle gives a panorama of rock, water and ruralscapes that are truly spectacular in any season. Directions: Located on the west side of the city of Owen Sound. Follow 10th Street West to Springmount. Turn north on Highway 6. Entrance is on the immediate right. Parking available. Seen from the Bruce Trail, or glimpsed from Highway 21 heading west from Owen Sound, Jones Falls cascade 12 metres over the Niagara Escarpment. A one-kilometre walking trail leads through the Pottawatomi Conservation Area to the falls. From the entrance on highway 6 there is a parking area and tourist information center. The trail Head starts behind the building. Following the pathway along the Pottawatomi River is an impressive experience. With cedar trees virtually growing out of solid rock and the river cutting a course through the limestone this is another spot that offers year-round splendour for photographers. Directions: Follow the scenic Georgian Bay Route from 2nd Avenue West to Grey Road 1. Look for Conservation Area sign directing you west to parking area. The trail continued through the woods a short distance before breaking out on a bluff overlooking the falls. From here you can see the horseshoe-shaped falls drop to a quiet pool before Indian Creek flows on to empty into Owen Sound Bay. The main natural feature of this site is the horseshoe shaped waterfall, named after the Newash Indian tribe who lived in this area at one time. Almost 9 meters across and 15 metre high the falls were formed by the erosion of soft Queenston shale beneath hard Manitoulin dolomite, in a manner similar to Niagara Falls. Directions: Follow County Road 18 east to County Road 29 south, through the hamlet of Bognor where it heads east to Walter's Falls. The falls are found at the end of Front Street. The Beaver Valley splendour should never by hurried and this 5 hectare park with its picnic facilities invites the visitor to stay awhile. Perhaps it is the contrast of the gentle tree-lined river and the patchwork of pastures and orchards set against the stark cliffs of the Escarpment that makes this panorama so compelling. But it is a breathtaking vista and there is nothing else quite like it. On site you’ll find a historical plaque dedicated to American naturalist John Muir; picnic shelter, privies, drinking water; and a parking area that can accommodate buses. Directions: Follow County Road 40 east to County Road 7 south, through Fairmount and Epping, into the Beaver Valley. Catch County Road 13 south to Eugenia. The entrance to Eugenia Falls is diagonally across from Eugenia Falls Emporium. Situated in the very tiny village of Eugenia, Eugenia Falls Conservation Area encompasses 23 hectares of Niagara Escarpment, river valley and upland forests. The site features hiking trails, a picnic pavilion, privies and a war memorial, as well as the 30 metre tall waterfall. Directions: Take Highway 4 west to the East Back Line north. Turn east on Lower Valley Road. Watch carefully; the only entrance markings are two yellow posts on the north side of the road. Look for the sign displaying the parking lot area. Considered one of Grey County's best-kept secrets, Hoggs Falls are tucked away a mere two-minute walk from the Lower Valley Road near Flesherton. Named for William Hogg, the waters of the Boyne River tumble seven metres in this woodland setting. Durham is located at the junction of County Road 4 and Highway 6. The Conservation Area is located at the north end of Durham on top of the hill. Within the Durham Conservation Area, McGowan Falls takes the name of an early miller who used the waterpower of the Saugeen River at this site. Popular with anglers, the falls here are more gradual than some, yet scenic in their setting of cedars. McGowan Falls are portrayed in one of several murals that adorn buildings in downtown Durham. Durham Conservation Area is situated in an ideal location, nestled along a picturesque stretch of the winding Saugeen River. It is also a leisurely trek from the heart of the Durham town centre. It covers over 61 ha (150 acres) including over 3 kms (2 miles) of Saugeen River frontage. Scenic McGowan Falls is one of the highlights of this beautiful park. A wide variety of activities can be enjoyed year-round within the park, by both campers and day-users.